How can you improve on a delicious, roasted California almond? Surround it with a sweet, pastel sugar shell, of course. What you'll then have then are Jordan almonds. 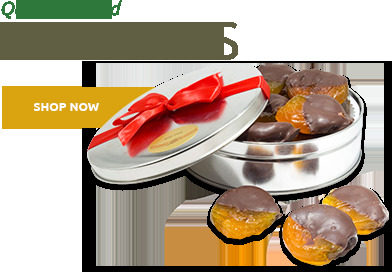 Turn a party into a truly festive special occasion with these delectable treats. 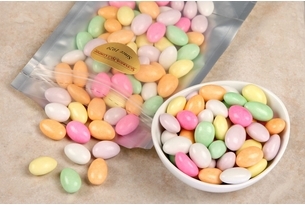 Perfect as party favors or centerpieces, Jordan almonds are more commonly known as the candy-coated wedding nuts. 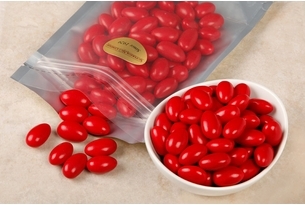 Wedding receptions all over the world have included these candy coated treats in a tradition that dates back centuries. 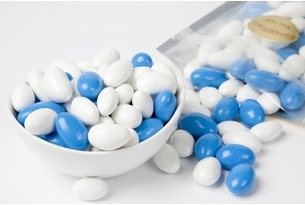 Jordan almonds were given to wedding guests as a gift to symbolize the happy couple's love and devotion. 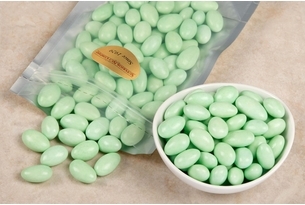 To create these delightful confections, we roast premium California almonds and cover them with a yummy hard candy coating in beautiful, soft pastel colors. Cultural conventions view the savory nut covered by the sweet candy coating as taking the bitter with the sweet and the perfect recipe for marital bliss. 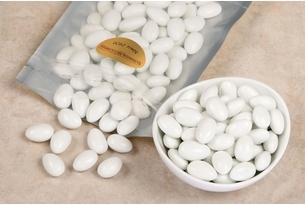 At weddings, Jordan almonds are often given out in odd numbers since they cannot be split evenly in two, symbolizing the inseparable bond of unity and togetherness for the happy couple. Our candy coated ones will make the perfect addition to the menu for your next wedding, anniversary party, or celebration. 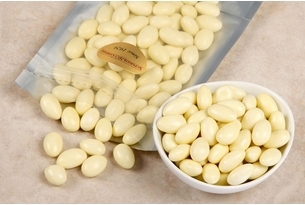 However, we have to warn you, not only are these treats wonderfully scrumptious, but in some parts of the Mediterranean, Jordan almonds are considered aphrodisiacs. Remember, you don't need a special occasion to eat these wedding treats; they can help make any event extra special. 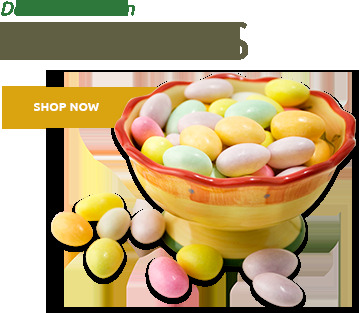 When you buy your Jordan almonds wholesale from Superior Nut Store, you’re getting light, fresh, incredibly tasty nuts made in keeping with the long-standing traditions of this favored treat. 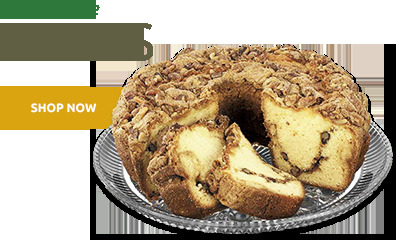 We add no extra starch, no unnecessary preservatives, and certainly no chocolate (unless you specifically order a chocolate variety), so you and your guests can enjoy them just the way they were meant to be enjoyed. 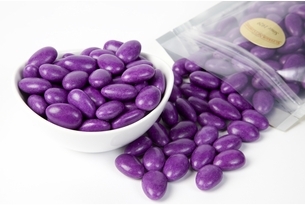 The only real difference you’ll notice is the wonderful explosion of colors we offer, making our bulk Jordan almonds the ideal confection for a wide array of special celebrations. 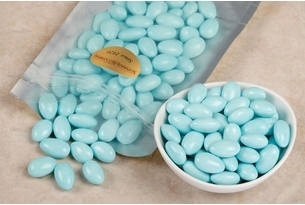 For instance, we offer our blue Jordan almonds in three delightfully different shades. Our light blue ones are a beautiful robin’s egg color, which would be perfect for Easter baskets, spring birthdays and baby showers. 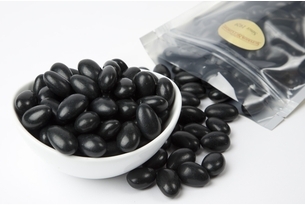 Our nuts are the precise shade traditionally used in Chanukah celebrations and bar mitzvahs, and our dark blue Jordan almonds remain one of our most popular choices for weddings and sporting events. Indeed, at Superior Nut Store, you can find premium almonds to match just about anything your imagination can conjure. We invite you to enjoy what may just be the best delicacies in the world today! 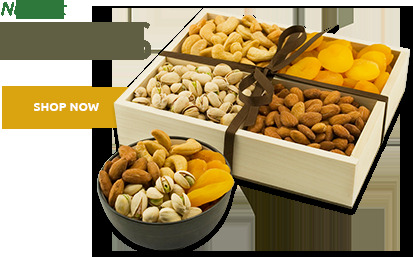 But of course, most folks come to us in search of edible wedding favors, and our wholesale nuts fit the bill perfectly. Wedding candy can be quite expensive, which makes these even more appealing. 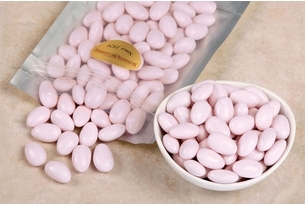 You’ll soon discover buying Jordan almonds wholesale is the only way to ensure that all your guests can enjoy these beautiful candied almonds to their hearts’ content. They are priced right, so go ahead—set out your wedding favors just as planned, and enjoy your special day. To help you in your quest for wedding day perfection, we offer colored Jordan almonds in a number of hard-to-find shades. 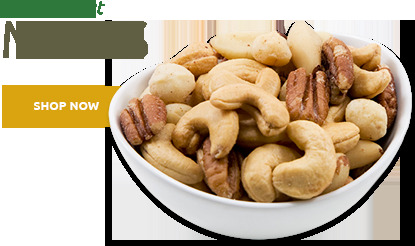 Naturally, our selection includes all the traditional colors, from pastel nuts to our radiant pure ones. 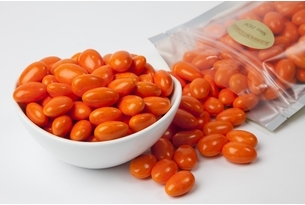 But you might also be drawn to the eye-catching gleam of our precious gold and silver almonds—so elegant and formal! Whatever your wedding theme, we have the candy to match it. 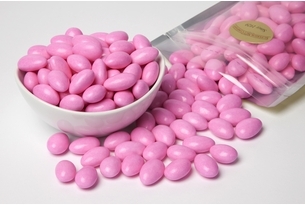 Choose from Jordan almonds in blue, pink, purple, red or any of several other pretty colors; all will make stunning favors you’ll be proud to serve. 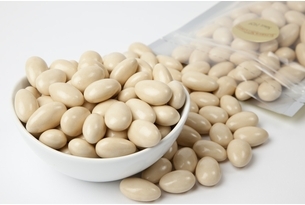 And dont forget, we also have chocolate almonds in many colors, just to sweeten the deal!